Click HERE to read Part III "Scrooge"
The ghost nodded and turned toward the door. He motioned for Scrooge to follow. "No!" cried Scrooge. "We can't leave. We must help him." The ghost drifted from the room. The Crachits' house faded, and Scrooge found himself outside. Clouds filled the sky, and an icy wind whipped through the trees. Scrooge glanced around. A gravel path led through rows of granite stones. "Why, this is a cemetery," said Scrooge. He stared at the ghost. "Oh, no. Not Tiny Tim. Don't tell me you've come here to show me his grave. It can't be too late." The ghost pointed at a new grave. A priest stood alone, praying. When the prayer was finished, the priest turned and strode away. "Is this the grave we came to see?" Scrooge frowned. "But where are the Crachits? And the other mourners? Why did no one come to the funeral?" 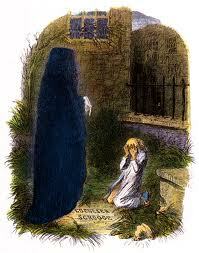 The ghost motioned toward the headstone. Scrooge squinted. Engraved on it were two words: EBENEZER SCROOGE. Scrooge stared. "Mine," he whispered. "The grave is mine." He turned to the ghost. "This is the future?" Scrooge closed his eyes. "Now I understand. I understand what you have been trying to tell me." He fell to his knees. "You must give me another chance. I will live in the past, the present, and the future." "I will live in the past, the present, and the future! I will live in the past, the present, and the future!" Scrooge cried again and again. He opened his eyes. He was in his own room again. The spirit was gone. "Oh, thank you!" Scrooge scrambled from his bed. "I've been given another chance. And I WILL live in the past, present, and future." Scrooge flung open his window. The aroma of freshly baked bread drifted on the crisp morning air and into his room. Horses clip-clopped over the cobblestone street. "You! You there!" he shouted to a boy on the street. "What day is this?" The boy gave Scrooge a puzzled look. "It's Christmas, sir. Christmas morning." "Good! I haven't missed it. Here, lad." Scrooge rummaged in his dresser drawer and pulled out a bag of money. He tossed a handful of coins to the boy and said, "There's a big, juicy turkey in the butcher shop window at the end of the street. Buy it and deliver it to Bob Crachit's house." The boy held up the coins. "But, sir. You've given me too much. This is twice what the turkey will cost." "Keep the rest for your trouble. Hurry now. The Crachits are hungry." The boy grinned. "Yes, sir!" He scurried away down the street. "Oh! Young fellow?" Scrooge called after him. The boy turned. "Yes, sir?" "Have a merry Christmas," said Scrooge. "Thank you, sir," said the boy. "And merry Christmas to you, too." Scrooge dressed in his finest clothes, planted his top hat snugly on his head, and set off down the busy, snowy street toward his nephew's house. Everything looked very familiar to Scrooge. "It's just like before," he said, "when the Ghost of Christmas Present showed me the street on Christmas morning." He tipped his hat to a group of carolers and waved to a coachman who drove past. A family hurried down the street toward the church, and Scrooge stopped to pat their young son on the head. "Here, young fellow," Scrooge said. He reached into his pocket, pulled out a penny, and handed it to the boy. "Buy yourself some Christmas candy." The boy stared at the coin. "Thank you, sir." "Merry Christmas to you," said the boy's mother. "And God bless you." When Scrooge reached his nephew's house, his nephew was surprised to see him. "Uncle!" he cried. "Did you change your mind about Christmas dinner? Have you come to celebrate the holiday with us?" "Yes," said Scrooge. "If you will have me." "Of course we'll have you!" said his nephew. His nephew took Scrooge's hat and coat and led him into the dining room, where his wife set an extra place at the table. "We're so glad you could join us," she said. "You've arrived just in time to carve the turkey." After dinner, Scrooge pushed his chair back from the table. "Thank you," he said. "I've never eaten a more delicious meal. I hate to leave so soon, but I have another stop to make, and I can't be late." He donned his coat and hat, and hurried down the street to Bob Crachit's house. The Crachits were surprised to see him. "Oh, Mr. Scrooge!" said Mrs. Crachit. "How can we ever thank you for this wonderful turkey?" Scrooge smiled. "By enjoying every bite," he said. Scrooge turned to her husband. "Crachit, you've worked long hours without complaining for many years. It's time I gave you a raise, don't you think?" "Why, yes! Thank you, sir," said Bob Crachit. "You're so generous." "Nonsense," said Scrooge. "I should have done it years ago. I promise I won't make you wait so long for your next raise." Scrooge kept his promise, too. He raised Bob Crachit's salary and made sure Tiny Tim got the very best medical treatment. 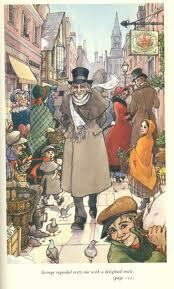 Tiny Tim grew tall and strong, and he told people that Mr. Scrooge had become a second father to him. Everyone said Ebenezer Scrooge was the only man who knew how to keep Christmas all year long. 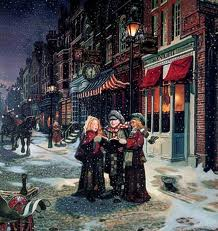 He draped his office in pine and holly, gave money to the poor, and sang Christmas carols even in July.